In light of this, socialisation classes can be seen as a “vaccination against bad behaviour” in the future. It cannot prevent all bad or unaceptable behaviour, just as vaccinations cannot always prevent all disease; but with the correct input at the right time, as well as constant boosting, this type of “vaccination” can be highly effective in producing a well-adapted, stable and confident animal. Many studies illustrate that certain time frames within the development phase have a high level of influence over the rest of the animal’s life. Researchers have determined three to sixteen weeks as the most influential period in terms of socialisation for the dog; and two to seven weeks as the corresponding period for cats. There has been some controversy over the exact dates of this critical period, but certainly there is unanimous agreement that early experiences prior to adolescence are of fundamental importance in shaping your pet’s personality. Between 10 days and three weeks of age the puppy’s eyes and ears begin to open, and so the bombardment of the senses begins. At this stage the experience of life really begins, and can have a massive and lasting effect. If puppies are over-stimulated during this period they can become restless individuals, with a tendency for hyperactivity. Conversely, if they are under-stimulated they can become over-reactive to stimuli and show fearful responses later on in life. From about three weeks of age the puppy begins to learn about social interaction with other dogs, other species and people. Social play becomes evident, and the pup begins to acquire skills which enable him to read the body language of other animals and to respond appropriately. Bear in mind that some breeds of dogs, such as Border Collies, like to engage in chasing games; while others, like Rottweilers, prefer to wrestle. Being exposed to different types of play will help your puppy to relate to and understand other dogs better in his life as an adult. Your puppy will be able to read the signals for play without feeling threatened. This is a very important process to help avoid unnecessary aggression or fear later in life. Socialisation is also very important from a health point of view because it helps the veterinarian not only to treat your animal more easily, but also aids in diagnosis. For example, an animal that is extremely nervous in the consultation room can show dramatic increases in heart rate, breathing rate and may even cry out when touched. This makes diagnosing specific problems or areas of pain more difficult than in the relaxed animal. Very aggressive animals often need to be muzzled or sedated, making the diagnostic process more complicated. Puppies in the socialisation phase must be exposed to as many different people as possible. Some trainers advise arranging that the puppy meet a hundred people before three months of age. As most puppies only go to their new homes at two months of age, this number probably sounds rather daunting. It is however an admirable goal and one that can be achieved more easily than one would think with the help of puppy school or a few well timed braais at home! Even taking a puppy to a nearby open air restaurant where dogs are allowed will help to expose it to a lot of people because most people just cannot resist puppies. Care must be taken with puppies until they have had at least two vaccinations. Trips to the park or markets or even puppy school must be avoided until these have been given or the risk of disease is increased. Visitors at home are encouraged, as are outings to safe places with a small population of vaccinated dogs. It is important that the puppy sees and hears a vast range of different things, but only in a controlled and safe environment. For example, if the puppy plays with a dog that is too rough, and the owner is not on hand to monitor the play, then the experience can do more harm than good. Similarly, if a puppy is exposed to the sound of a radio but the volume is not controlled and gradually increased, there is a risk that the puppy would become afraid and have a negative association with this sound. It is necessary to be aware of stimuli which may be frightening for an animal. For example, a puppy exposed to people cheering on their favourite sports team on television, or shouting abuse at the opposition or referee , may very well cause the puppy to hide in a corner with this behaviour being repeated every time the television is switched on. 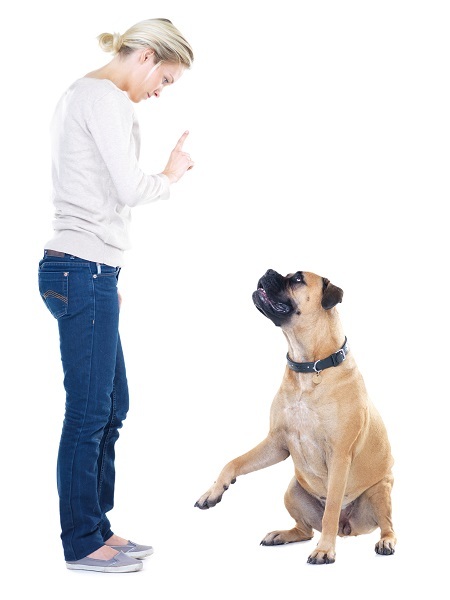 Some dogs are more predisposed to aggression than others, and socialisation is more vital in certain breeds. In general, extra effort is required in large breed dogs, as they tend to be more difficult to manage when they become adults. Breeds with a reputation for aggressive or dominant behavior include Rottweilers, Boerboels, Pitbulls, Anatolian Shepherds and German Shepherd dogs. Boerboels, for example, were bred to protect the ox wagons during the Great Trek so the protective instinct is deeply instilled in them. There is still a place for this trait in the modern day, but with a change in lifestyle trends towards smaller properties and more confined spaces, it becomes the owner’s responsibility to manage this tendency for aggression and also ensure that the dog gets sufficient physical exercise. Anxiety-prone and highly active dogs will also benefit hugely from a higher degree of socialisation. These include Weimeraners and Huskies. Temperament has approximately sixty five percent heritability, so any pup from parents that have had social adaptation problems will require extra effort due to the genetic tendency. A puppy’s behavior may change significantly as he matures, and temperament is only considered to really be established after three years of age. For this reason, no matter how cute and cuddly your puppy may be at six weeks, it is worthwhile to invest in his personality by socializing him at the time when it will have the biggest effect on his future – between three to sixteen weeks of age. Your efforts during this time will be paid off by allowing your puppy to become what he is meant to be – man’s best friend.